Crisp and clean ocean front home on Pacific Avenue. Let the peaceful and secluded enclosed front patio lull you into your relaxing Cayucos vacation. From the entryway, the open floor plan welcomes you with unobstructed north and south ocean views from the kitchen, dining area and living room. A slider opens from the dining area out to the ocean front patio. Sit on the benches or at the umbrella covered table to watch board surfers, kite surfers and stunning Cayucos sunsets. The living room offers a Queen sofa sleeper, a gas fireplace and a 40" flatscreen TV with DVD player. The vintage kitchen features original tiled counters and brand new stainless steel appliances. The 1st bedroom has a King sized bed. The 2nd bedroom has a King sized bed, 2 Twin sized beds and an ensuite bath. Park in the two car garage and store your bikes, surf boards and beach toys! This home is located between the 21st St. beach access and 24th St. beach/surfing access. 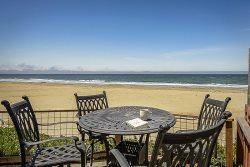 The property is also walking and biking distance to downtown Cayucos, the pier, shops and restaurants. Washer and Dryer in garage as well as a small charcoal BBQ. Full sized Gas BBQ in enclosed patio.